It is also acceptable to link to this page on other websites and in emails using the title above and the following URL: http://internet4classrooms.com/printables/common_core/math_mathematics_5th_fifth_grade/description_download_29101-CCSS.Math.Content.5.NF.A.1.htm or simply: http://i4c.xyz/y7xmplhj. The answer key corresponding to this worksheet may be found here: http://i4c.xyz/yb68eguq. 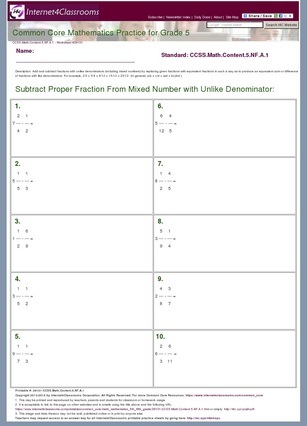 Problem Type: Subtract Proper Fraction From Mixed Number with Unlike Denominator. 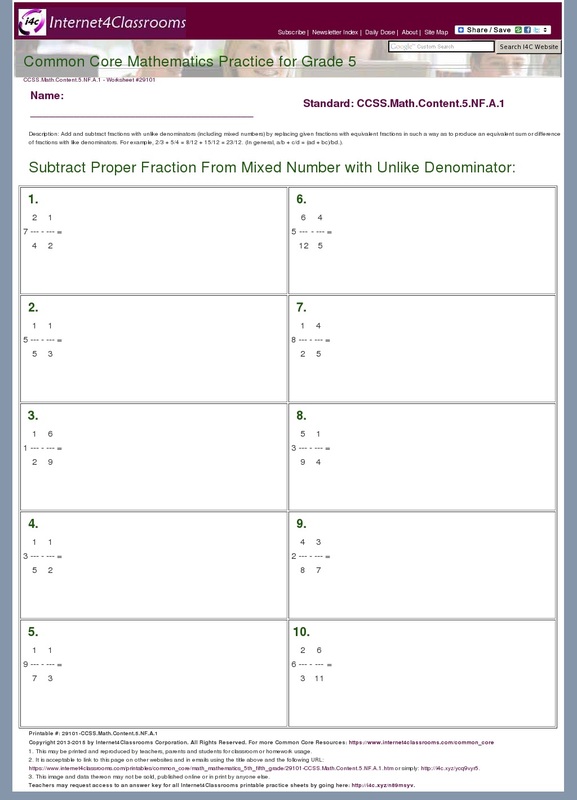 Add and subtract fractions with unlike denominators (including mixed numbers) by replacing given fractions with equivalent fractions in such a way as to produce an equivalent sum or difference of fractions with like denominators. For example, 2/3 + 5/4 = 8/12 + 15/12 = 23/12. (In general, a/b + c/d = (ad + bc)/bd. ).